Was it even worth watching the first time? Many years ago my doctor sent me to a rheumatologist. During the interview the rheumatologist recommended I start taking Zoloft to help with my depression. At the time I thought why on earth would a take an anti-depressant? I went to visit the doctor because of back pain, sciatica, degenerative disc disease. I tried explaining to the doctor that if I was depressed it was due to the constant pain I was enduring. Fix the pain, the depression goes, too. In the end, she prescribed Zoloft for me. I took the drug a total of one time. It left me so wrung out, I slept for 18-hours straight and then had a rough time getting up out of bed. Thanks, but, No, Thanks. I don’t care that it might have been only temporary. After watching The Marketing of Madness, I thank God that I had the sense I was born with to turn down this doctors treatment. I have family members on psychiatric drugs and now I’m terrified for them. These drugs are dangerous and nothing is being done to protect us. Everyone has a piece of the pie, the doctors, the pharmaceutical companies, even our legislators turn a blind eye. No one is looking out for us, not the FDA, not our doctors, no one. Blind eye is probably the wrong term. These government exployees tasked with our safety are actually being paid by the companies they’re reviewing. This is crony capitalism. I’ll never forget the day I learned my daughters doctor had prescribed a powerful psychiatric drug for her to treat her diagnosis of Bipolar Disorder — while she was pregnant. Her doctor claimed it was perfectly safe for the baby — yet no studies have been done to back up this claim. In fact, many children have been born with missing appendages and other serious birth defects. We can’t prove it, but it’s entirely possible this drug actually caused my granddaughter’s birth-defect. If you, or someone you love is taking psychotropic drugs, if you are considering stopping taking psychotropic drugs or you are considering starting treatment with psychotropic drugs, you owe it to yourself to be fully informed. Please take the time to watch this video series. It could save your life or the life of someone you love. 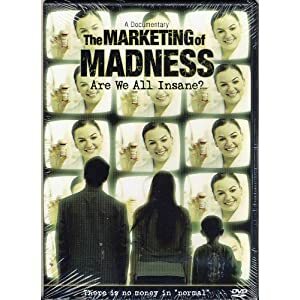 You can order a copy of The Marketing of Madness from Amazon, watch the complete series online for free. You may even find a copy at your public library. The Marketing of Madness is unavailable at this time from Netflix. It doesn’t matter how you get it, but you need to watch this powerful presentation. Many of the drugs side effects may actually make your ‘mental illness’ worse. Psychiatric drugs can induce aggression or depression. Some psychotropic drugs prescribed to children are more addictive than cocaine. Psychiatric diagnoses appears to be based on dubious science. Of the 297 mental disorders contained within the Diagnostic and Statistical Manual of Mental Disorders, none can be objectively measured by pathological tests. Mental illness symptoms within this manual are arbitrarily assigned by a subjective voting system by a psychiatric panel. It is estimated that 100 million people globally use psychotropic drugs. This entry was posted in Genre: Documentary, Genre: Educational and tagged Children, documentary, drug companies, drugs, expose, FDA, film, marketing, mental health, psychotropic drugs by Shawn & Annette. Bookmark the permalink.